Heuer: The Timekeeper of Formula One | Skinner Inc.
Wristwatches and automobile racing have been closely linked to each other since the early 20th century. In a sport so heavily reliant on speed and times, having an accurate and accessible timekeeper is paramount. Modern chronographs, the predecessor to the stopwatch, were created in the early 19th century and were primarily used for artillery. Through the 20th century, chronograph wristwatches transitioned for use into other activities such as diving, submarine maneuvering, and airplane piloting. While utilized by the U.S. Navy and NASA, the chronograph became most associated with competitive auto racing. Formula One racing rose to prominence after its creation in the 1940s. Aided by technological advances in mechanics and aerodynamics as well as humanity’s fascination with speed, Grand Prix racing gained significant popularity throughout the 1950s, 60s, and 70s. Because of this, drivers and the watches they wore became synonymous with the sport. Few other companies are linked so widely to racing and these iconic drivers as TAG Heuer. The Heuer workshop was founded in Switzerland by Edouard Heuer in 1860. By 1887, Heuer had patented his first chronograph as well as the oscillating pinion, which are still used in mechanical chronographs today. In 1911, he patented the first dashboard chronograph, designed for both automobiles and aviation. Throughout the company’s history, Heuer has been an innovator, catering to the needs of drivers, becoming highly regarded within the racing and horological communities. Heuer eventually became the gold standard and one of the leading producers of stopwatches and timing equipment in competitive racing. Because of this reputation, we see the famous Formula One drivers, such as, Niki Lauda, Jo Siffert, Jochen Rindt, Ayrton Senna, as well as Steve McQueen in the film Le Mans, all wearing Heuer timekeepers. Skinner’s September 8th-16th online auction of vintage wristwatches will feature one such watch. The Heuer Autavia ref. 3646 third execution chronograph (Lot 2515) commonly referred to as the “Andretti” after Italian American racing legend Mario Andretti, is one of the most sought after in the Autavia line. Featuring a Valjoux 92 manual-wind movement, an attractive reverse-panda dial, and a rotating bezel, this circa 1968 timepiece is a classic. Surpassing most two-register chronographs from the 1960s, you would be hard-pressed to find a watch associated with as much racing history. 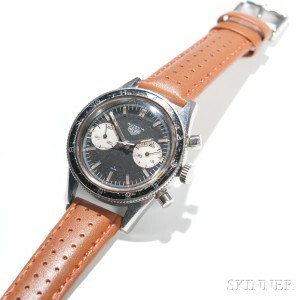 Also featured are two Heuer Autavia “Viceroy” ref. 1163V automatic chronographs (Lots 2517 and 2519) promoted with Vel’s Parnelli Jones Racing, who employed Al Unser, Mario Andretti, and Joe Leonard. Find these and other Heuer watches in our current Jewelry, Affordable Luxury, Coins online auction, as the Heuer community celebrates the 100th anniversary of the Mikrograph, the first stopwatch timing to 1/100ths of a second. 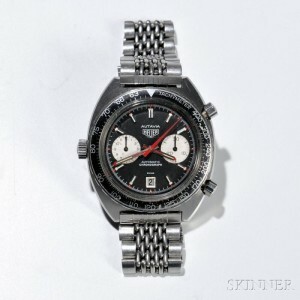 This entry was posted in Blog and tagged Ayrton Senna, chronograph, Heuer, Heuer Autavia, Heuer chronograph, Heuer wristwatches, Jo Siffert, Jochen Rindt, Le Mans, Niki Lauda, online auction, skinner, Skinner Marlborough, Swiss chronograph, TAG Heuer, timed auction, timekeeper, vintage chronograph, vintage timekeeper, vintage watch, vintage wristwatch, watch, watch auction, watches, wristwatch, wristwatches by Kyle Johnson. Bookmark the permalink. Tag Heuer is one of my favorites in watches and this piece looks such amazing to wear. I am so grateful to read the information in your blog! You have added useful knowledge to me. Thanks a lot for such a great share! This article has a great piece of information for about the Tag Heuer. I am really fascinated with all this information about the Tag Heuer. I am definitely buying one for myself. Thanks for sharing.